I could not find our old snowman snow gauge, so I ordered a new one from the garden supply catalog! It is meant to measure snow in the winter and then be a trellis for clematis or sweet peas in the summer. Really cool metal garden art! I love your snow gauge. Where can I get one? Wow. I think it was from a Garden Catalog. 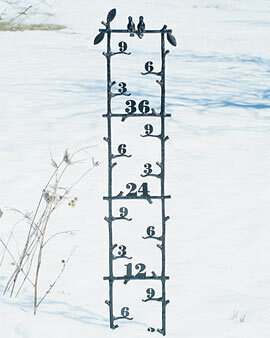 Did anyone ever find this trellis/snow gauge ? I’d love to get it for a Christmas gift for someone! I got it years ago from Gardener’s Supply Catalog.